In a tiny village, Juliana Karisa stood beside her house in anticipation as she watched a canter truck accompanied by Wildlife Works’ greenhouse team make its way through her compound. After a courteous greeting, she proceeds to direct the team to where the tree seedlings are located. The greenhouse team then loads the seedlings one by one into the truck under the close supervision of Greenhouse Supervisor Willy Kanyeki. A member of the greenhouse team during the seedling collection. Juliana and her family is one of hundreds of beneficiaries from the Kasigau Corridor REDD+ Project who have received cash in exchange for tree seedlings. In an effort to boost reforestation efforts in the region, Wildlife Works regularly purchases and replants tree seedlings. The greenhouse team travels to different locations in our project area to purchase tree seedlings ranging from Ksh 10 to Ksh 15 per plant from local farmers. The purchase provides a source of income to community members who have previously relied on unsustainable methods of agriculture to meet their daily needs. Juliana Karisa and her family during the tree seedling colection. This year alone, over 31,000 tree seedlings have been purchased from communities throughout the project area. In turn the communities have received payment of over Ksh 400,000 (approximately 4,000 USD), which according to Greenhouse and Agroforestry Manager George Thumbi, goes long way in motivating residents to plant more trees. “Communities receive direct cash as a result of taking care of tree seedlings. We also award more cash to individuals who have gone out of their way to take care of seedlings which survival rates are known to be low,” he says. After the purchase, the tree seedlings are kept at the Wildlife Works greenhouse where they will be nourished and prepared for replanting and later distributed for free to schools and institutions. Since 2012, Wildlife Works has been distributing free tree seedlings to schools and communities for planting. Prior to this, the culture of planting trees was not fully established in schools and communities in the project area. Today, the schools that Wildlife Works partners with proudly thrive with trees dispersed in all areas with some as old as 6 years. A member of the greenhouse team sorting out some of the tree seedlings. According to Mr Maina, 14,712 tree seedlings were distributed to schools, government institutions, religious organizations and individual community members and environmental groups for replanting in 2018. Reforestation is not just about distributing and planting tree seedlings; our greenhouse team monitor seedlings to ensure they are well taken care of. This helps to determine the survival rates of trees as well as how to cope with challenges incurred when taking care of them. Despite our commitment to planting as many trees in our project area, challenges such as lack of water is observed. Some of the schools and institutions also lack continuous fencing, so grazing animals can eat seedlings. Despite these challenges, a large number of tree seedlings survive thanks to commitment from school pupils. Some schools have developed a unique approach where each pupil is assigned a responsibility to take care of his or her own tree seedling. The commitment from these pupils is amazing, as some go as far as collecting water from their homestead to water their seedlings. A young boy displaying one of the tree seedlings. Apart from distributing tree seedlings to schools, communities and institutions, Wildlife Works also organizes joint tree planting events. Here, students, community members and other stakeholders are taught how to properly plant tree seedlings as well as protect them from grazing animals. This is also an opportunity to award hard-working conservationists with Wildlife Works’ t-shirts! We are happy that communities in our project area are shifting to appreciating the value of trees in providing shade, food, oxygen as well as combating climate change. With all these elements in place, we foresee a positive outlook for the flourishing ecosystem of rural Kenya. 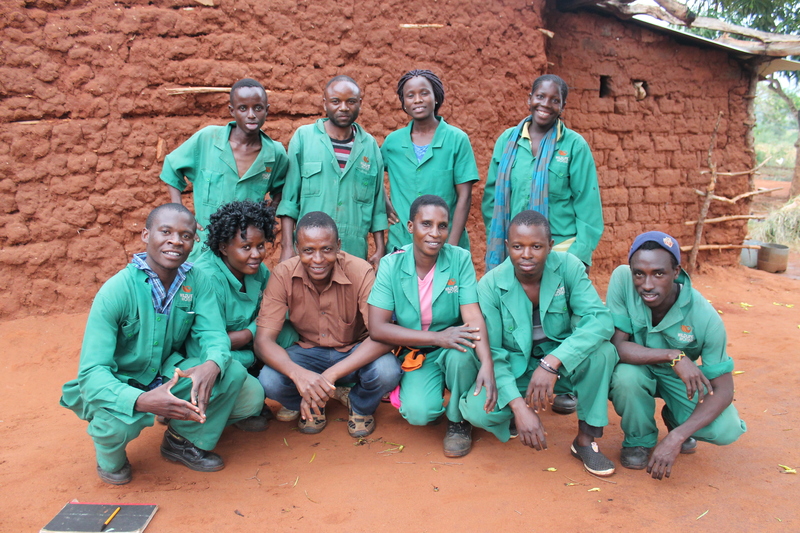 Members of the greenhouse team pose for a photo after collecting the seedlings. Next Where are the Gaps in Conservation Finance?